When the Inter-American Defense Board created the Maritime Coordination Area for the South Atlantic in 1959, cooperation had a different scope for enhancing maritime security and promoting Maritime Domain Awareness. Nevertheless, the changing scenario as late as 2015 shows a dedicated reinforcement of protocols and regimes to guarantee that states can cover the actual vulnerabilities that challenge maritime transportation and security. Naval Control of Shipping is one of the main problems for the development of a region such the Americas and cooperation agreements have been playing an important role to permit states have the same guidance and work together to deal with the remarkable difficulties around security of the transnational commerce. In that sense, controlling variables that may threaten maritime situation awareness is one of the aspects that are commonly included in the hemisphere regional organizations, but also, specialized ones as to make inter-agency work at a lower level, based on strengthening protocols and the valuation of common standards. In this respect, the Americas have been from the various types of organizations, some dealing with a necessary institutional renewal, others looking for the complex agenda states are involved in. In addition to the Inter-American Treaty of Reciprocal Assistance – signed in 1947, Rio de Janeiro – the some decades ago projected a plan for the inter-American defense coordination of the maritime traffic (Plan para la Coordinación de la Defensa del Tráfico Marítimo Interamericano – PLANDEFTRAMI, 1959). The CODEFTRAMI substituted the first plan by the end of 1996 and it has divided the areas into four groups: North Atlantic, South Atlantic, North Pacific and South Pacific. Whereas differently oriented, the process of institutionalization was effective for the Atlantic South Area, called AMAS (Área Marítima del Atlántico Sur), that was formed by Brazil, Argentina, Uruguay, and Paraguay. 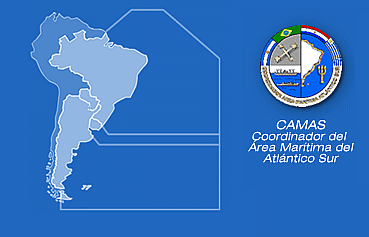 The Coordination for the South Atlantic Area (CAMAS) would have a biennial rotated command occupied by one of the members from the highest Navy authority (a position currently alternating among Brazil, Argentina and Uruguay). At this point we might ask what is the key position such an organization has nowadays based on the fact that multidimensional tasks are taking place. Although helping to create a sense of developing both technical systems and institutional capabilities, AMAS is still a step back compared to forums where different agents can contribute to the success of a variety of circumstances, legal arrangements and diffuse actors. Also, its public visibility is short, with a limited confluence to the regional approach on borders reinforcement and security. A coverage to the cited gap could be the CAMAS proposal on promoting cooperation with ZOOPACAS Organization, to enhance cooperation reaching the area bordering Africa (Uruguay, XXVI Reunion de COLCO). Considering the multidimensionality of those efforts, one of the main causes for the diminishing interest in promoting institutionalization is how the lack of capabilities and resources affects the management of correlated institutions in crossing themes and areas. The Comisión Permanente del Pacífico Sur (CPPS), built after the Declaración de Santiago, 1952, is an example of this eventual overlapping compromises that fall onto some of the other regional engagements in course, proposing itself on behalf of the Seguridad Integral Marítima, an even broader understanding of maritime security. While focused on maritime sustainable development more than security and the use of maritime routes, the CPPS played an important role helping Chile and Peru, both founding members, provoke diplomatic discussions on the maritime limits harmonization in the South America Pacific, and clearly is a way to deal with the main topics that the Pacific South and North Maritime Areas inside CODEFTRAMI could ultimately cover. Furthermore, CPPS has done a memorandum of understanding with the International Maritime Organization (IMO) that enables it to join the international maritime regime as a legitimate observer actor, as well as did ALADI (Asociación on Latino-Americana de Integracion), CARICON (Caribbean Community) and OAS (Organization of American States) in the Americas. Then, the CAMAS initiative has still an important responsibility in the South Atlantic and it still can be the best means to improve South-South Cooperation, as it can even command the maritime area if members decide. As the way to integration has been from micro-level agency cooperation to the macro-level of state’s foreign relations institutions and vice-versa, we can state that the multidimensionality paradigm may become the next source of CAMAS tasks on the region. Correspondingly, this can guarantee a better participation in other forums whenever the level of cooperation is open to other nations from inside or outside of the continent. A good example is the combined exercise for maritime control (Ejercício Naval de Tráfico Marítimo), named TRANSOCEANIC Exercise, which is being held over years together with Mexico, Chile, Peru, Ecuador and South Africa, and can clearly provide protocols and common guidance to the other actors and common platforms. CAMAS also participate annually in the COAMAS exercise and the biannual TRANSAMERICA Exercise (as part of Plan CODEFTRAMI), where there are other Americas countries together with AMAS members: Mexico, Chile, Ecuador and Peru. For better and constant communications, recent improvements that can be cited include the already implemented system called REDE AIS DA AMAS, from where protocols and cases can be shared to partners. One trending topic that can be cited as a way to articulate the different locus of technical cooperation and, ultimately, stirring accountability on maritime security is also deepening communication standards. Over time, communications has been a central topic when considering the possibilities of maintaining security with the prevalence of states’ authority in its respective area. That is how technical cooperation has been built in the South America zone making possible arrangements that fulfill needs and commit exchange of information based on equivalent systems. Guaranteeing that those institutions be maintained and integrated as observers in each other’s initiative is a way to boost cooperation without losing focus and the micro-level decision making process. A sub-regional seminar on surveillance systems is a good example, as proposed this year to Brazil by IMO (International Maritime Organization) and counting as members on the Portuguese speaking countries of Africa and, as observer, the South Atlantic Area Coordination and the Guinea Gulf Center for Maritime Security. One of the results that could be part of the initiatives above is the recognition of a transition from controlling to cooperating, which not only was proposed by NATO on its willingness to approximate the commercial shipping community, but also can be seen in the South America as a prevailing policy. When talking about outcomes, there is also a consciousness that regional integration in the macro level has in someway helped those micro-agencies projects succeed, when domestic political actors would reinforce that direction. Sabrina Evangelista Medeiros is a professor at IADC-OAS (Washington, DC), Programa de Pós-Graduação em Estudos Marítimos – Escola de Guerra Naval and PPGHC-UFRJ (Brazil). She received a PhD in Political Science at IUPERJ and her main area is international cooperation and reputation.